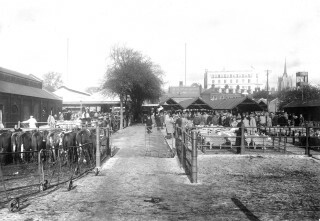 Recording of a cattle auction at the livestock market in Chelmsford (SA 24/1280/1). This was recorded on the occasion of the reopening of Chelmsford Cattle Market after it had been closed for six weeks because of foot and mouth disease in the early 1950s. The full recording also features part of a horse auction and an interview with Alderman Hugh Wright about the market. The cattle market moved to this location from the High Street in 1880. It stayed here until 1963, when it moved to a new location in Victoria Road, to make way for the High Chelmer shopping centre that is still in place today. We believe the market moved again to Springfield, then out to Boreham, before finally closing. A recording made in this site will sound very different today, but what about a recording made at the markets we do still have in Chelmsford? Or Stanfords Livestock Market in Colchester? Or the car auction at Boreham? How do these different scenes of commerce compare?